Create with Gwen: Holiday Catalog Goes Live! It's sweltering HOT outside, but as crafters, we need to get our heads together and prepare our upcoming Holiday projects! From Halloween to Valentine's Day, this year's Holiday Catalog is full of awesome products and project ideas! 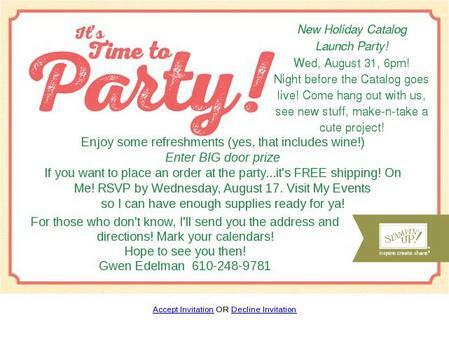 Join us to see some new goodies, play with some new products, chat, enjoy refreshments, and just hang out together! Visit My Events page HERE to register by Wed, August 17th!!! Register for a friend, bring them with you to share the fun, and get an extra Door Prize entry!